An interesting attribute of this three dimensional model of clustering of the energetic attributes of living things is that it has 12 edges. Using the 24 hour energy flow represented in the 2 dimensional “Wheel” from Traditional Chinese Medicine (TCM), the flow of energy through the 12 meridians can be mapped onto the Star. From this authors experimentation, it appears that there is only one way in which the meridians can be mapped that encompasses the rules of energetic flow as depicted on the Wheel, which is the most ancient Chinese model for mapping energetic flow through the human body. 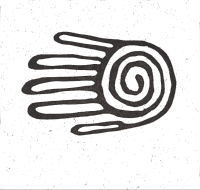 When organized in this way, the star affords a three dimensional perspective of that which is represented two dimensionally on the wheel. This three dimensional model, while including all of the relationships present in the wheel, offers many more relationships that when viewed from this perspective, have an equal potential for energy balancing. It additionally affords differing perspectives for viewing the energetic dynamics off the 12 meridians from TCM. This model is perhaps an order of magnitude more complex than the two dimensional model presented in the Chinese “Wheel”. To simplify using the model, I have organized balancing options in relation to a specific meridian of interest. This meridian is listed in the first column of the attached table, while the rows to the right of this meridian contain meridians in specific relationships. These relationships are based on how the meridians are dimensionally related to the meridian of interest. 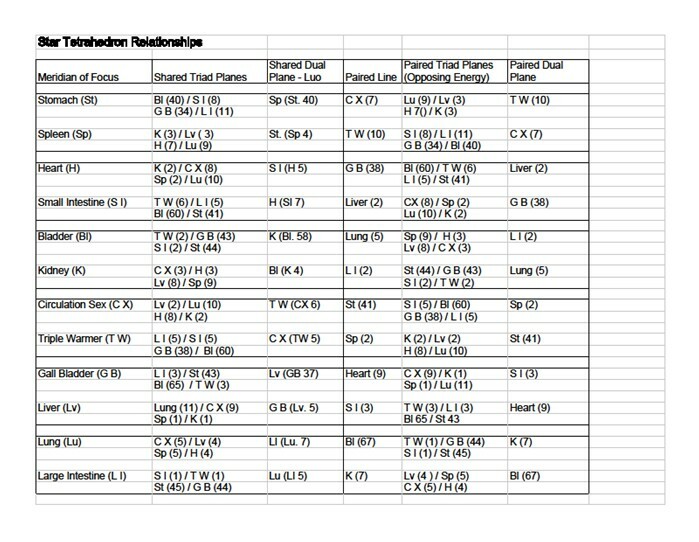 These dimensional relationships as organized in the table in the link here are discussed in the next section. While the Chinese model of energy balancing pays attention to the flow of energy through the meridians, the broader body of energy medicine pays equal or greater attention to the vibrational qualities of energy, its resonance or dissonance in relation to other energy segments. When viewed two dimensionally this quality of synchronization of resonance is not apparent, however in a three dimensional model, vibrational relationships become much more easily distinguished. When viewed in this way, a priority of balancing options emerges. This priority assumes that balancing the resonance of energetic filaments that share a dimension will have a more direct effect than balancing the resonance of energetic filaments which do not. This establishes the order of the columns of meridians. The Acupressure Holding Points (AHP) listed are the points to bring the meridian into resonance with the element of the meridian in the first column. The tetrahedron is the most primitive of the Platonic solids, meaning it is the simplest known geometric form in three dimensions. 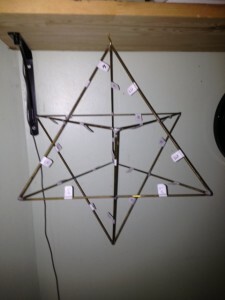 The Star Tetrahedron is a combination of two tetrahedrons with opposed orientation. 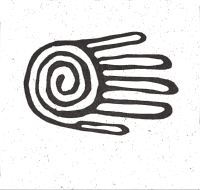 In spiritual context, these two solids are usually taken to represent the male and female attributes of energy clusters. 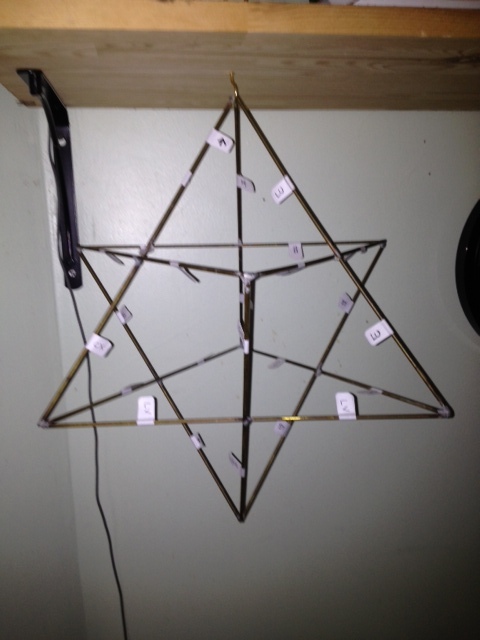 The bulk of the male, or yang tetrahedron is above the horizontal mid line of the star, with the bulk of the female, or yin tetrahedron below. This principle, with the added assumption that the upper body meridians should be placed on the star above the placement of the lower body meridians established the meridian placement guidelines. Following these two guidelines, and placing meridians on the star in the 24 hour cycle as represented by the Wheel, it seems that there is only one solution for the placement of each meridian. This is a key point, as more than one solution would deeply challenge the utility of the model. Once labeled, a variety of energy relationships can be observed in the star that are obscured in the wheel. These are clusters of three meridians that include the meridian of interest. There are two of these clusters for each meridian. Because these meridians share either Yin or Yang energy, they can be synchronized to the meridian of interest using command points. If you have an energetic imbalance with three meridians, one in the first column and two in one of the next two rows, this would be a priority balancing option. These are clusters of two meridian that combine to make the elements. Each plane contains a Yang and Yin meridian, and they are balanced using the Luo points. The Star Tetrahedron has 6 faces (cube) and each element encompasses one of these faces. An imbalance in any of these faces is a priority balancing option. These are meridians which run parallel to each other. On the wheel, these meridians are represented in the mid-night, mid-day cycle. These meridian are balanced using the command points for the element of the meridian of interest. An imbalance based on this relationship would have a slightly lower priority although these meridians share a dimension, they are physically separated, and will entrain by the quality of waves known as Sympathetic Resonance. These are clusters of three meridians which have opposing energy to the meridian of interest. Each row has the plane which runs parallel to the triad cluster of the meridian of interest. These meridians are also balanced to the meridian of interest using the command points of the element of that meridian. 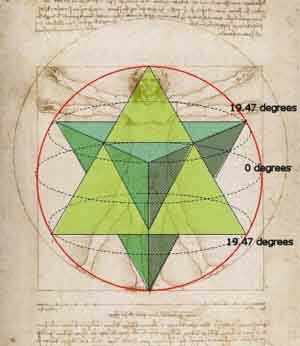 These are meridians of another element that share a plane with the element plane of the meridian of interest. From the Star model, this meridian appears to have the weakest relationship with the meridian of interest as it’s orientation is shifted 90 degrees. These are balanced using Command Points. The 24 hours cycle of meridian flow, when examined from the perspective of a static, three dimensional structure, has some interesting characteristics. As living things circle around with the rotation of the planet every 24 hours, at any given time a meridian or pair of meridians faces the sun. This facet of maximum exposure can be considered the time of day of that meridian(s). As the static structure continues to turn with the rotation of the planet, each meridian in the 24 hour cycle has a period of maximum exposure. It would not be so much that meridian energy flows from one meridian to the next, but that each meridian (or meridian pair) would be maximally stimulated and dominate the energetic dynamics at some point in the 24 hour cycle. This concept suggests a few interesting points. It suggests that the stars of all living things are aligned in the same orientation independently of how those living things move about. It also suggests that the stars of all living things maintain a similar alignment, in relation to their longitude on the planet. When we travel, our star must realign with the local orientation, which it what occurs in the Time of Day Balance. The Star Tetrahedron model for energy balancing affords a slightly different perspective on the Chinese model of balancing excess or deficient Chi. Energetic vibrations of differing frequencies and timing will combine either constructively or destructively. This is commonly referred to as Interference. Using this quality of interacting waveforms, an understanding of which was not available to the ancient Chinese Seers who formulated the acupuncture model, we can view energy balancing as modifying the timing (phase), frequency (pitch) and amplitude (volume) of waveforms (meridians). 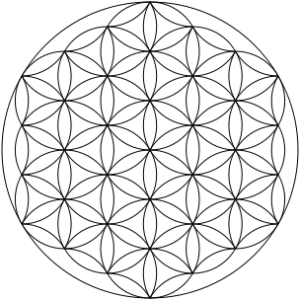 This is true for clusters of meridians that are dimensionally connected, and those the are dimensionally parallel, through the quality of vibrational synchronization. From this perspective we do not so much move Chi from regions of excess to where it is deficient, as bring waves into a more harmonious and supportive organization. Client presents with an issue which is placed in circuit using Circuit Retaining Mode. The priority meridian is identified and stacked with the issue. The client can hold this stack. Opening the table we look across the rows for the priority meridian. For example, if the priority meridian is Spleen, we see K / Lv, and H / Lu. We check the alarm points for these meridians, and if we find an imbalance, we hold the AHP for the meridian pair. These points will balance the elemental resonance for those two planes. Continuing across the row we continue to hold points for any alarm point that shows. Consequently, we have checked the alarm points in the order: (H/Lu; K/Lv), St, TW, (SI/LI; GB/Bl), CX. At best, this model is a theorem. I continue to experiment with it by using the table as a balancing guideline, and often find interesting relationships and clues as to where proceed in an balance. The relationships correlate quite well with my experience in energy balancing and I rarely find that I have “dead ended” in using it. There are many assumptions in the model, the biggest one being the points for balancing. I would be very interested in any comments and suggestions as to how to further develop the model, particularly information on other acupoints that relate to the meridian clusters described in the table.